Seqonomics: PGD: The third way? Apart from prenatal and carrier tests, which I discussed in my last two posts, there is a third option: Preimplantation genetic diagnosis (PGD). Here, the mother's eggs are fertilised in a test tube, just like in standard in virto fertilisation (IVF). The genotype of the resulting embryos is determined, and those that are likely to develop disorders are screened out. Only one or two embryos that are judged to be least likely to develop a disorder are implanted into the mother's uterus and allowed to develop further. Currently, most IGV clinics select embryos based on factors such as size and healthy appearance. 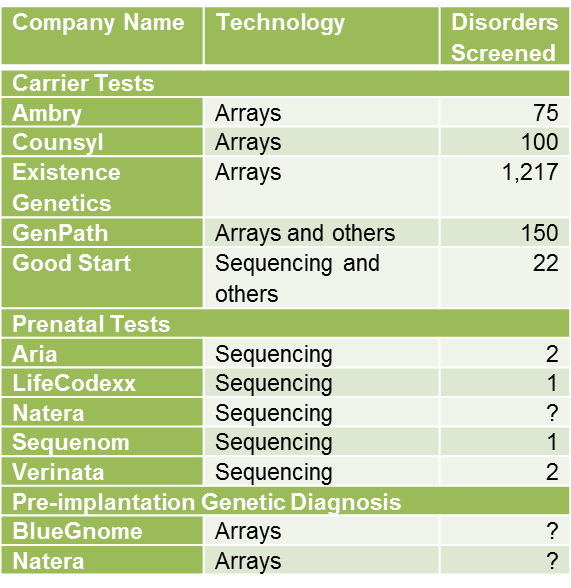 There is no company that I could find during 15 minutes of googling that offers a sequencing-based PGD solution, and only two that provide an array-based solution: BlueGnome and Natera. This is surprising, as such technology would in principle allow screening for a similarly large number of disorders than carrier tests, and even positive screening, as imagined in the film Gattaca. The most likely reason for this lack of competition is in my opinion that ethical and technical hurdles remain. An alternative explanation is that the PGD market is severely limited by people preferring to make babies the traditional way. 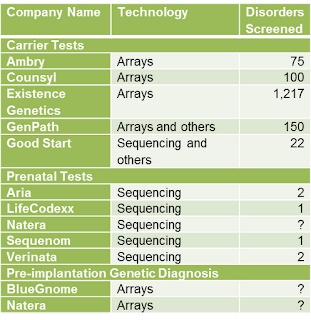 I think that Sequenom's MaterniT21 test only screens for a single disorder, trisomy 21. Do you hae any information on the two other disorders?